The two important things that I never forget to carry in my bag are- lip balm and a lipstick that is moisturizing to my dry lips. In winters I avoid all matte lipsticks as they only highlight my dry patches on lips and make them look worse. I was really unaware of how budget friendly Maybelline lipsticks are until I was confronted with this fabulous lipstick on Nykaa. 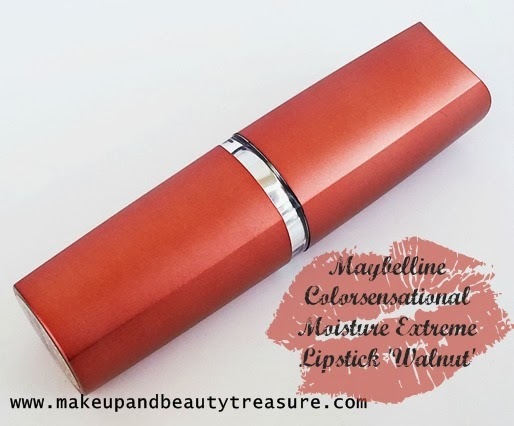 Today I am going to discuss my experience with Maybelline Colorsensational Moisture Extreme Lipstick in Walnut. Maybelline Colorsensational Moisture Extreme Lipstick comes in a smooth semi glossy colored casing (same as that of shade) with a silver central ribbon. The color of the casing represents the color of the lipstick that makes it convenient to identify the shade in case you hoard many from this range. 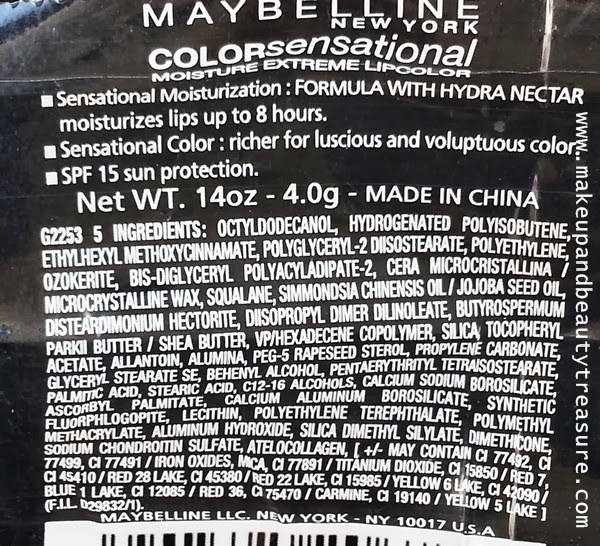 The shade name and number are printed on the sticker that is stuck at the bottom of the tube. The packaging is quite light and can be easily carried around in a makeup bag. The lid snaps shut satisfactorily without any play. 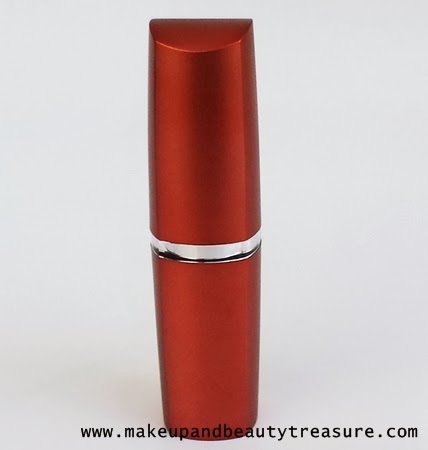 The lipstick comes sealed with a plastic wrapper that ensures you that it has not been opened or used. The packaging is fairly simple and pretty to look at. The scent of the lipstick is very mild and is hardly noticeable. 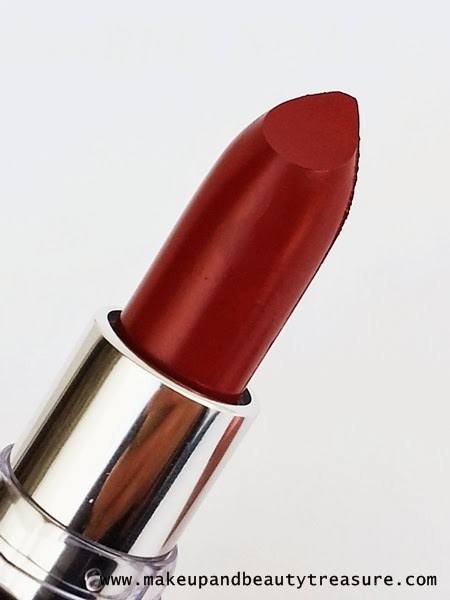 The formula of the lipstick is very soft, smooth and creamy (though not buttery!). It applies and glides across my lips smoothly, evenly and effortlessly. I prefer applying lipstick on its own rather that with lip filler. It does not bleed, feather or highlight chapped lips. It is really moisturizing and I do not feel the need to use a lip balm underneath it. It does not feel heavy or greasy on my lips. My lips feel soft, smooth and moisturized. The pigmentation is pretty superb. It gives true deep color in a single coat which I absolutely adore. You can always layer it up for a more intense and dramatic look. 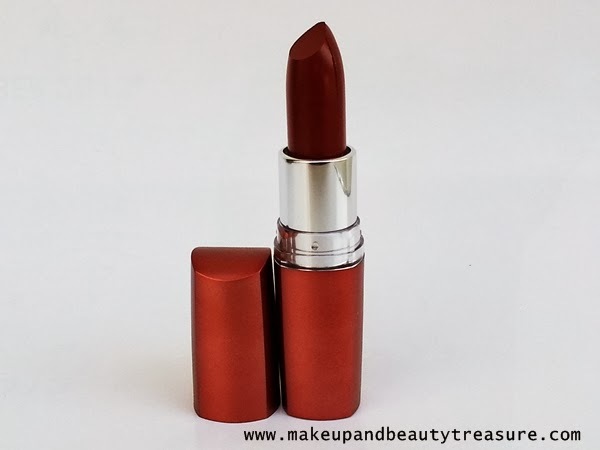 The lipstick gives full coverage and you will love it if you have pigmented lips. 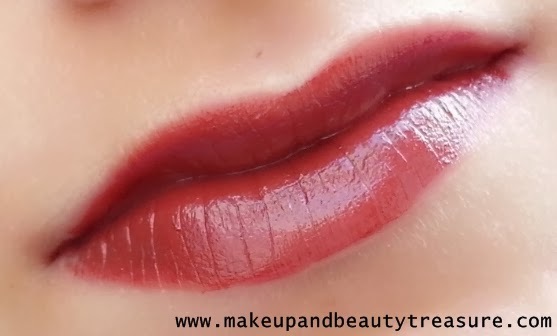 The finish of the lipstick is even, smooth and slightly shiny. The longevity is pretty good. It stays put on my lips for a good 4-5 hours with light meals and few drinks in between. After that it starts fading leaving a tint behind. It transfers easily on mugs, glasses or when you remove your dress or top. It is easily removed with a lip remover without drying or staining the lips. Walnut is a gorgeous deep brown color with no shimmers or glitters. 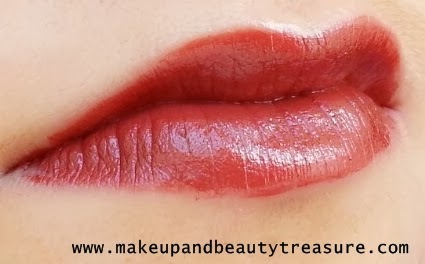 It has lovely satin-y and smooth finish and does not settle into fine lines of the lips. It instantly brightens up my face and would look flattering on all skin tones. You can layer it up for a party look or even apply it with a light hand for an everyday look. Although it does not make my lips appear fuller but it does define them beautifully. • Glides across the lips easily. • Wide range of shades available. You can get them on Nykaa. 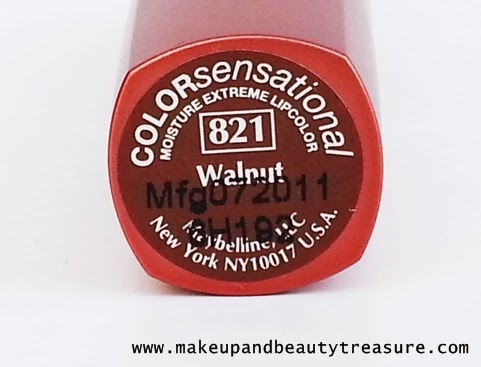 Overall Maybelline Colorsensational Moisture Extreme Lipsticks are good quality lip colors with a reasonable price tag. They apply smoothly and feel really moisturizing on the lips. They have a wide range of colors and I am definitely going to try more from this range. Walnut is a pretty deep brown color with satin-y finish. I would highly recommend it to everyone. 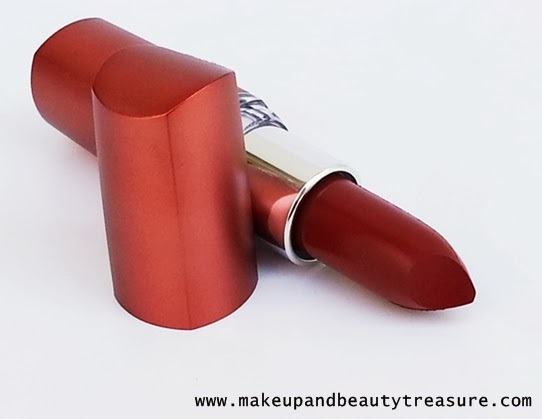 Have you tried Maybelline Colorsensational Moisture Extreme Lipstick? How was your experience? Share in the comments section below! Thanx so much dear. It really means a lot to me! What a pretty shade Meghu, it looks awesome on your lips. Thanx Swati :) I agree! not a fan of these type of shades....but looks good on u! Do try these shades rachna. They look good when worn with a light hand! The colour is deep. Lovely. 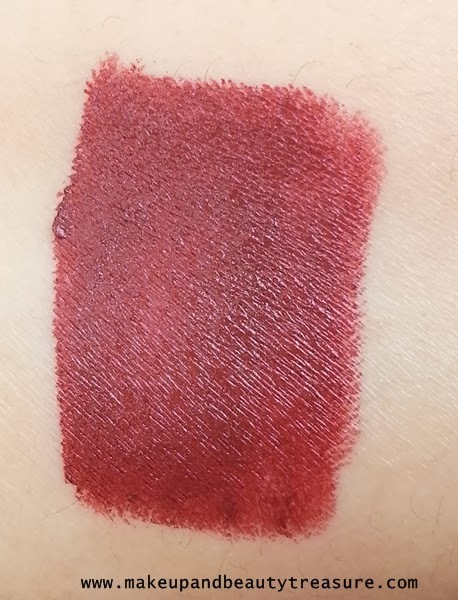 The Shade is Super Pretty And So, Seems The Quality!